In 1956 Elvis Presley was booked to open for the Louvin Brothers tour, but he was rising so fast, he was the headliner before the tour was over. The late Charlie Louvin comments on these dates. Biographer Peter Guralnick also speaks about Presley’s first Las Vegas shows that were not nearly as successful as his late 60s/early 70s run. In stores now from Legacy Recordings – The Elvis Presley: Legacy Edition features his landmark RCA debut album plus more masters from those 1956 sessions on 2 discs. 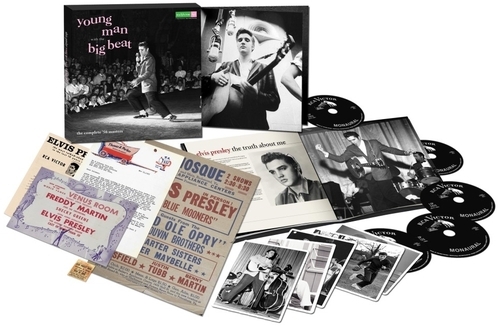 The Young Man with the Big Beat 5-CD box set adds three more discs of previously unreleased outtakes, live tracks and interviews in a deluxe package with expanded liner notes and collectibles as pictured below. More details at elvisthemusic.com.